In colonial times, ocean-going ships could sail up the Rappahannock River all the way to Fredericksburg. This made the tiny but growing town a bustling seaport. All types of goods were loaded onto ships to be sent to Europe while others were unloaded to be sold right here in the colonies. George Washington, Fielding Lewis, their families and slaves, as well as the town’s other residents were all members of a wider community centered on the trade traveling back and forth across the Atlantic Ocean. The townspeople of Fredericksburg saw sailing ships on the Rappahannock every day. Those ships brought goods to sell and to buy, news from the rest of the British Empire, and people to settle and work in the colonies. Washington, Lewis, and their neighbors interacted with the sailors from these ships every day and were aware of the hardships of life at sea. Map shows actual voyages of British ships in the last half of the 18th century according to their log entries. Learn more about how the map was created and compare British trade routes with Spanish and Dutch ones on the Spatial.ly blog. Created by Geographer James Cheshire, PhD, and used with permission. George even experienced life at sea first-hand when he left Ferry Farm and Fredericksburg to sail to Barbados for a visit at the age of 19. This journey is the only time Washington left the confines of the future continental United States. For a time, George, supported by elder half-brother Lawrence, even toyed with the idea of joining the British navy until Mary, George’s mother, firmly refused to give her permission. For his part, Fielding Lewis made his riches from shipping goods to and from the colonies. Shipping cargo, ship owning, and ship building was the family business started by his father John. In the 1600s and 1700s, tobacco was Virginia’s most important export but, for a variety of reasons, many planters in this area chose to export things like wheat, timber, and other raw materials. Using the raw materials exported from the Americas, manufactured goods were made in Europe and then sent to Africa and back to the Americas. The manufactured goods paid for slaves in Africa and for more raw materials in America. 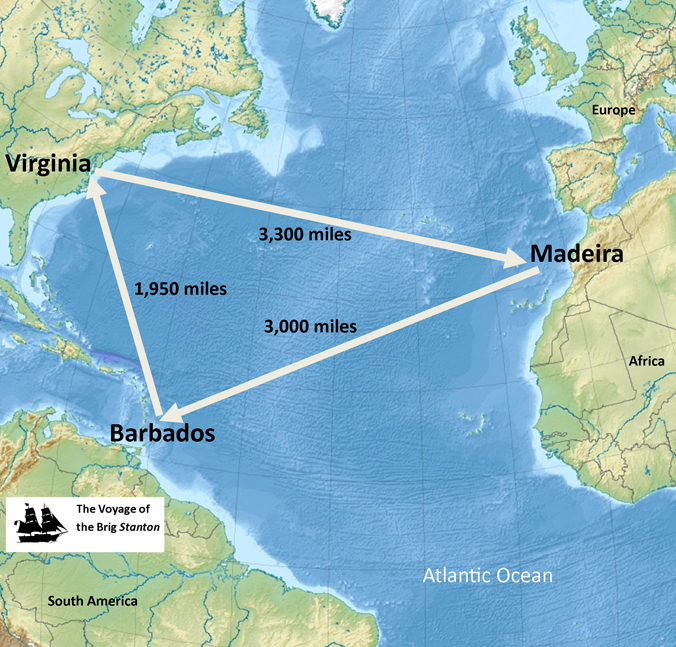 Often known as the ‘triangular trade’ because of the triangle shape it forms on a map, this historic trade pattern is one we learn as early as elementary school. More than goods traveled along these trade routes. People (sailors, settlers, and slaves) moved along them as well. All of these movements created connections between nations, colonies, and groups of people in Europe, Africa, the Americas, and beyond. The Atlantic Ocean was at the center of all these connections. “Every European or African who moved to or was born in Virginia” was also a member of what historians call the Atlantic World. A voyage typical of those that took place within the Atlantic World was made by one of John Lewis’ ships in early 1732. On December 23, 1731, the 80-ton brig Stanton — captained by Richard Williams — set sail with 8 crew and 2 guns aboard. The Stanton was a brig, a sailing vessel with two square-rigged masts. While we have no idea what the Stanton itself looked like, a replica ship named the Lady Washington provides an idea of a brig’s size and appearance. 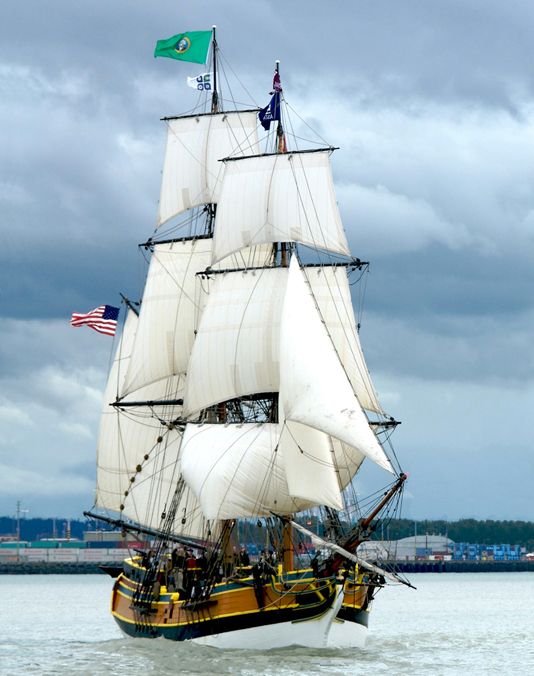 The tall ship, Lady Washington, under sail in Commencement Bay near Tacoma, Washington. Photo by Miso Beno. 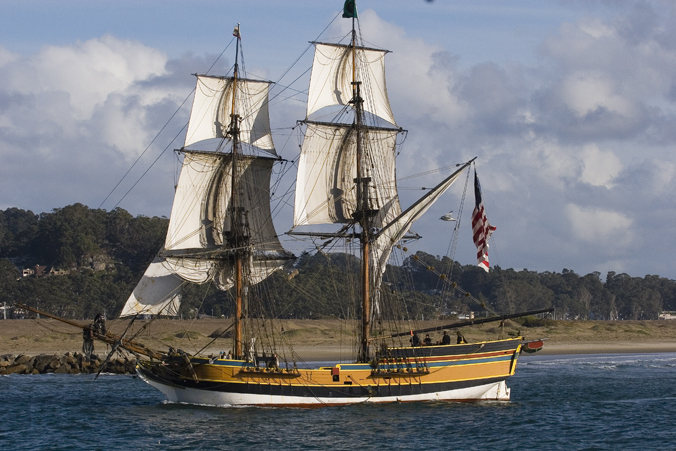 Brig Lady Washington in Morro Bay, California. Photo by “Mike” Michael L. Baird. If you look closely at the people toward the ship’s stern in the photo, you can appreciate just how small a brig can be. Imagine crossing the stormy Atlantic Ocean in a ship that size! As it left Virginia, the Stanton’s cargo was listed as “46 Pipe Staves, 1800 bushel corn, 1000 bushell wheat, 40 [tierces] of Bread, 15 barr[els of] flower, 1 bar[rel] of lard, 300 lb of beeswax, 2000 feet plank, 1100 feet heading & 15 barr[els of] Pork.” Surprisingly to us, in this age before refrigeration, butchered livestock was an important export for Virginia. The Stanton was bound for the island of Madeira 550 miles off the coast of Portugal. The specific cargo exchanged at Madeira is not listed but, after that exchange, the ship set sail for Barbados in the Caribbean Sea. Once more, cargo was exchanged but specifics were not recorded. After a five month voyage covering 8,250 miles, the Stanton finally returned to Virginia on May 10, 1732. When the ship came into port in the colonies, it’s cargo included “Rum – 21 [tierces and] 16 barrels, Sugar – 14 Barrels [and] 11 Qt. Casks, 8 Negros, 3 baggs ginger, & Sundry household goods.” Though not specified in the Stanton’s case, sundry household goods shipped to the colonies included ceramic and glass dishes, different cloths, jewelry, and books. The Stanton’s voyage, the ports it visited, and the cargo it carried are all exceedingly typical of Atlantic World trade throughout the 1700s, whether in the earlier decades of John Lewis or the century’s later decades of his son Fielding. Ultimately, situated where farm, frontier, city, river, and road converged on the edge of English empire and the Atlantic World, the people of Fredericksburg found their daily lives governed by Britain’s global economy and imperial culture. Colonial men – whether gentry, tradesman, or servants – pursued homes, professions, pleasures, and possessions that conveyed their status, wealth, and English identities. Fielding Lewis used the ships he owned and the wealth he gained from actively participating as a British merchant in the Atlantic World to fund the struggle to throw off English colonial control, to do his part to support his brother-in-law’s army, and to create a new nation. Special thanks again to Geographer James Cheshire for permission to use his map of British trade routes. Visit Spatial.ly, his geography blog, at http://spatialanalysis.co.uk/. April Lee Hatfield, Atlantic Virginia: Intercolonial Relations in the Seventeenth Century. Philadelphia: University of Pennsylvania Press, 2004: 39.